Really quick and easy donuts made from ingredients you probably already have. My 3-year-old loves these because he can have them whenever he wants. There's hardly any waiting time. Use any topping you want. Our favorite is powdered sugar! Stir the vinegar into the milk, and let stand for a few minutes until thick. In a medium bowl, cream together the shortening and sugar until smooth. Beat in the egg and vanilla until well blended. Sift together the flour, baking soda, and salt; stir into the sugar mixture alternating with the vinegar and milk. Roll dough out on a floured surface ¹/₃ to inch thickness. 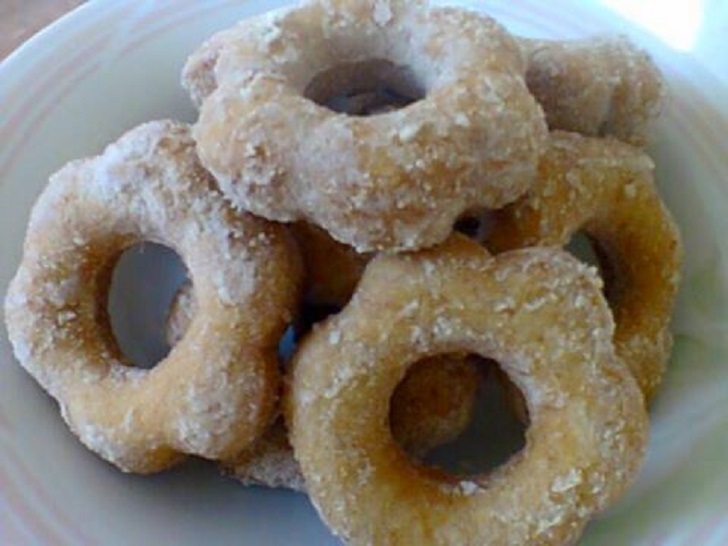 Cut into doughnuts using a donut cutter. Let stand for about 10 minutes. Heat the oil in a large deep skillet to 375°F (190°C). Fry doughnuts in the hot oil until golden, turning over once. Drain on paper towels. Dust with confectioners' sugar while they are still warm, and serve immediately.